Within the past couple of weeks, I have easily been averaging 2 baked desserts/day. Healthy or not, baking is my way of de-stressing & taking a breather. Some desserts were successful & others fell short, but friends soon began complaining that I was baking too much & their waist lines were feeling it. (Note to self: Remember what you learned in your high school photography class, so you can take pictures to properly document your “special” baking habit). So, I made a promise to myself to stop baking. Guess how long that lasted? Barely 24 hours, but hey, at least that was 24 hours when the kitchen looked the most presentable it has looked in months. However, because I have a not so healthy & definitely not so secret addiction to the Food Network, my will not bake slowly but surely deteriorated. I had about half of a bag of Mint Guittard chips left (good timing with St. Patty’s day next week, no?). For those of you who have not heard or tried Guittard, I fully recommend them. Nothing like the taste of premium chocolate melting in your mouth…. Please pause for a moment while I day dream & drool about Guittard. Ah, now where was I? Oh yes, BROWNIES! What’s a better way to get ready for St. Patty’s day than combining decadent chocolate chips with gooey, rich brownies? They're begging for a taste! 1. Preheat oven to 350 degrees. Spray an 8 by 8 square baking dish. 4. Slowly add in the dry ingredients to the wet mixture. 5. Fold in the Guittard Chips. 6. Pour into pre-sprayed 8 by 8 baking dish. Bake for 18-20 minutes, or until the top sets & a tooth pick can easily slide through the center of the brownie. Let cool for as long as you can stand it. Cut & serve with a cup of milk, or any other special beverage for St. Patty’s Day. 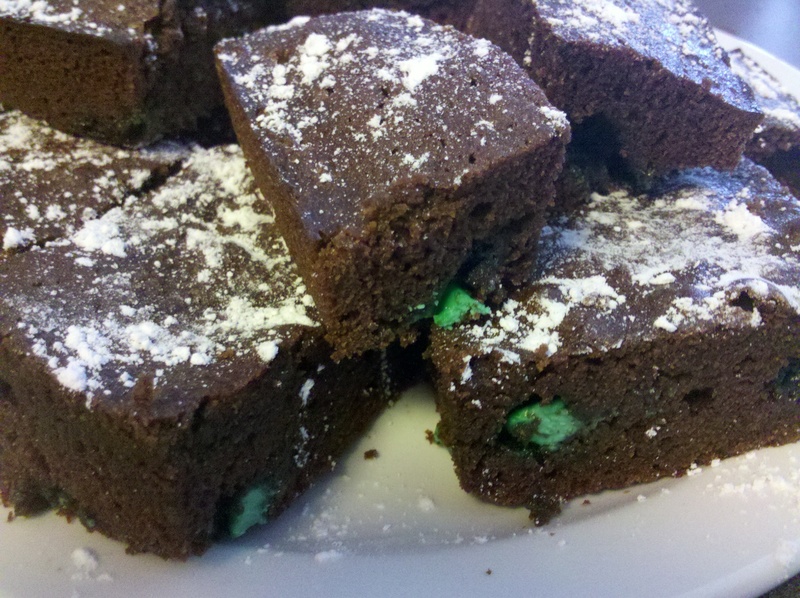 This entry was posted in Desserts and tagged brownies, mint chips. Bookmark the permalink. Delicious dessert. Thanks for sharing. I like your dog, so cute!!! Yum! Everytime I say I am going to bake here in France, my French family always expect me to whip up brownies, and only brownies, haha! I will have to try your recipe out of them! Thank you! I hope your French family will enjoy the brownies. I can only imagine how amazing the chocolate in France must be.